"While it didn't have the emotional resonance of recent the Oscar winner 'Frozen' nor Disney/Pixars' 'Inside Out', 'Zootopia' is a fun movie with a good message..."
Disney’s Frozen left some big shoes to fill, not just because it earned them Oscars but it marked a return to form for the studio responsible for so many instant classics. Their first entry this year, Zootopia, looked to have all the makings of another classic: anthropomorphic animals and taking on big world issues in a kid friendly manner. Zootopia is a movie that young and old will enjoy, but another smash like Frozen it is not. Zootopia follows a young rabbit named Judy Hopps (Ginnifer Goodwin) as she tries to solve a missing animals case as she struggles with adversity being the first bunny on the police force. 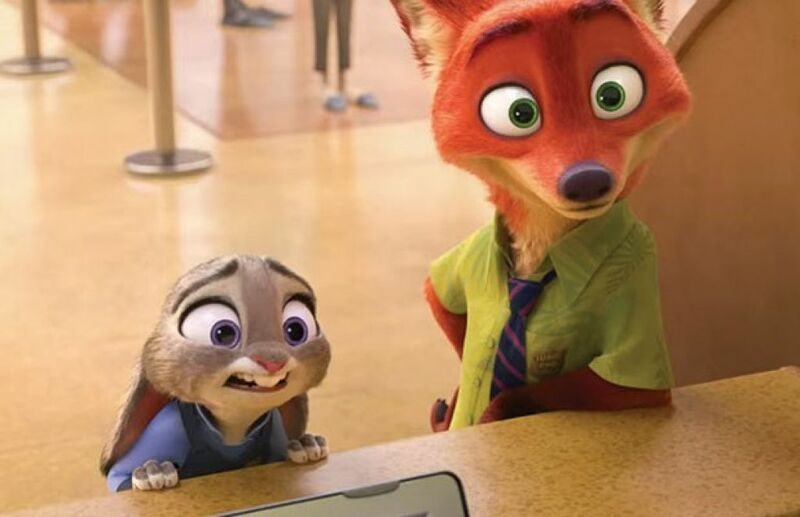 Hopps is helped by a con-artist fox named Nick Wilde (Jason Bateman), who happens to be the only witness on a case that will elevate her from meter maid to a real cop or destroy her career. Goodwin and Bateman have great chemistry in their unlikely partnership, especially Goodwin who really carries the movie on her shoulders. Like any Disney flick, there are plenty of memorable voices and cameos Idris Elba, J.K. Simmons, Tommy Chong, and Canadian newscaster Peter Mansbridge as Peter Moosebridge to name a few. They are all typecast of course, but it doesn’t matter, as one of the funniest parts of the movie involves Chong leading an interview with an elephant that supposedly has a great memory (not true in this case), and all the while he is giving out all the answers unknowingly and commenting about how he wishes his memory was better. Dave’s not here man. Canadian news junkies will recognize the voice of their most prominent newscaster Peter Mansbridge as Peter Moosebridge. I’m not sure if the timing on the message of this movie is an intentional rebuttal against an American politician who must not be named, but much of the subject matter has to do with racism. While the carnivores and herbivores get along on the surface, there is an underlying tension between the different species–and not just between meat eaters and plant eaters. When Hopps first arrives at the police station, she is called “cute” and proceeds to explain how bunnies can say that word to each other, but it isn’t okay for other species to say that to bunnies. Then later in the film the tensions explode when carnivores are blamed for the Zootopia’s problem, which is made up of ninety-percent herbivores. While the movie is fun for the most part as during the police investigation, things get pretty hairy when animals start reverting to their savage ways. There is one scene where a predator goes “full animal” that may give some of the younger audience members a start, and some of the investigating and police drama scenes might bore the young ones too. Not the sloth scene though thanks to the reactions of Hopps as their slow nature drives her bunny instincts completely nuts. These slower parts of the film filled with exposition really showcase the elephant in the room with modern Disney films, Zootopia isn’t a musical. This is what may hold it back from being the smash hit with kids that it could be. Shakira gets the credit for the only singable song in the film, and it would have been much better if Hopps had sung it, as it was one of those songs that fit exactly what the character was thinking. In fact, all of the parts that dragged in the movie would have been more entertaining and memorable with a catchy Disney song filled with jokes and levity that the older audiences will remember from Disney’s heyday and also one of the sadder moments would have been helped by a song too. Did Disney get tired of making money off of karaoke DVDs and soundtracks? After Frozen made them tons of green while (almost) being a musical (too few songs to be considered a musical for me) it’s too bad Disney is still seemingly trying to impress disillusioned teens by axing the musical content that should be in their films. The musical numbers in Disney movies used to have some of the best jokes and fun animation and really resonate with children. While watching my nieces and nephews watch Disney, they usually don’t pay too much attention, until their favorite song comes on. The undertone about race relations really worked well, and it was done in a funny way so they didn’t become too preachy while still providing some teachable moments. 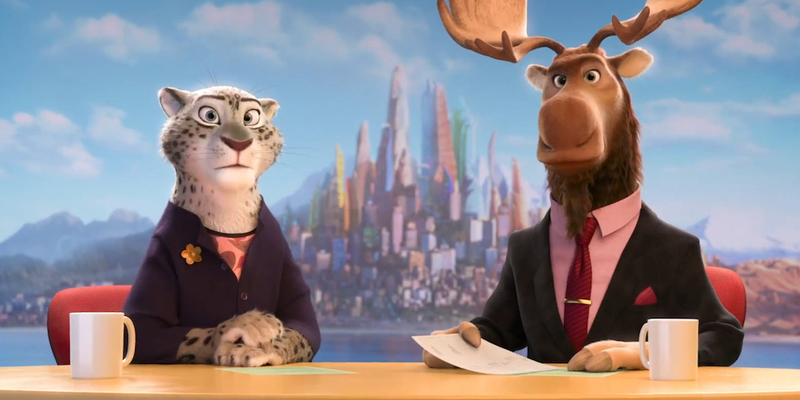 The film may be sending mixed messages though, as there are jokes about the differences between the animals, like when Hopps meets the Sloths at the DMV. If it’s not cool to call a bunny cute, then pointing out how slow a sloth is should be considered rude too. The whimsy that carried Frozen so well isn’t really present here, despite it being a film about a city filled with talking animals. While Zootopia can be pretty whimsical, it gets bogged down in the “adult” cop story that could have really used some music to keep things rolling. In true Disney form, there are plenty of references for adults, even a Breaking Bad laboratory with rams in yellow jackets and breathing masks named Walter and Jesse. If you’ve seen Breaking Bad, you’ll instantly recognize the lab as the one Gus built; the reference so obvious that they didn’t need to use the names Walter and Jesse. It’s not like the kids will know who they are and the adults didn’t need to hear the names to get the joke. While it didn’t have the emotional resonance of recent the Oscar winner Frozen nor Disney/Pixars’s Inside Out, Zootopia is a fun movie with a good message about not judging people based on their race or appearance. While only time will tell its place in Disney’s storied history, it is a fun tale filled with humour and excitement that audiences of all ages will enjoy, even if there is nothing there to sing along to.